The only thing I don't like? It's near impossible to get good lighting for pictures. Sorry if this photo came out a little sharp, but I had to edit it a bit. To the favorites that have a bit of a festive spin this month! Soap & Glory Flake Away - My dry skin craves exfoliation and this is a really great scrub! MAC Syrup Lipstick - Always one of my go-to fall and winter shades. Redken Thermal Setting Mist - Perfect to help your hair make it through holiday parties. Essie Stroke of Brilliance - Because holidays call for glitter. Naked 3 - I usually prefer the original palette, but this is so great for holiday looks. Have you tried any of these? I'd love to hear what you have been loving lately! Your pic looks great! That is a downside to this time of the year. It gets dark so quickly, and many more gray/cloudy days. 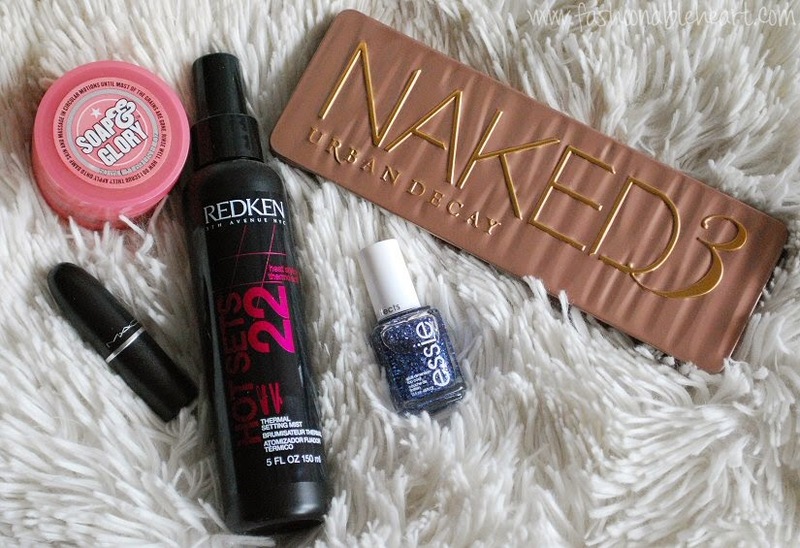 I love your picks, and love the Naked 3! I have to agree with you about naked3 I love all the rose gold shades! Winter is a tough time for getting good photos. It kind of drives me a bit nuts because bad lighting is such a pet peeve. I am new to the Naked Palatte bandwagon and ended up with #2. It was a tough call though! Heard so many positive things about the Naked palette. Haven't tried it yet though. Someday! All of them are great in their own way, but my favorite one is the original. It is so versatile. Can't recommend it enough! Hope you get to splurge on one soon! I find it hard to work with during the rest of the year, but it screams "festive!" to me. Or maybe I just wasn't giving it as much of a fair chance!